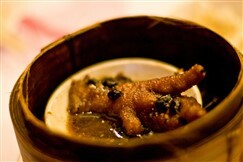 Dakbal is usually found on most lists of bizarre or unusual Korean foods as chicken feet are not usually consumed. However, in Korea and other Asian countries, it is considered a delicacy. Dakbal is best enjoyed in pochangmacha (tent bars) along with soju. It can be served boneless or with bones. Some restaurants also offer the choice of cooking it over the table or have it ready to eat. Whatever the choice is, the dish is always very spicy and not for the faint-hearted. The chicken feet are served in a sauce that is very spicy, slightly sweet and spiced with onions and chili seeds. In some restaurants, rice is served with the dish.